We are not protected anymore; in fact, nobody is safe in today’s connected world. Gone are the days when Internet used to be the most sophisticated and life-changing discovery known to mankind. We don’t’ control the technology any more, but technology controls us. What used to be the most significant technological innovation of all time, is a treasure trove of malicious programs such as Trojans, worms, viruses, malware, adware, and what not. Our very own personal computer is not safe anymore – the moment it connects to the internet, it’s prone to getting infected. This is why security is so important in this era of Internet of Things. The growing number of devices increases the importance of security proportionally. When you think of security, the first thing that comes to mind is antivirus. Antivirus software is nothing but a program designed to search, detect, prevent, and eliminate security threats such as viruses and other malicious programs that pose significant threat to your internet-connected devices. But there are dozens of companies that provide thousands of antivirus programs to deal with all kinds of cyber threats, so finding a reliable one is a bit tricky. That being said, Norton and Bitdefender are the two most recognized names in the antivirus business that provide complete security solutions for both consumers and businesses alike. We present a head-to-head comparison between the two to see who comes out on top in terms of security and popularity. Norton is one of the most trusted and reliable names in the antivirus industry which has long been at the forefront of online security and internet security. Developed by California-based Symantec Corporation, Norton is still one of the most popular antivirus programs in widespread use around. Symantec provides all-around security solutions to protect people and information in this connected world. The company, through its wide range of security products and utilities, helps people, businesses and even government organizations protect their most important data from emerging threats. Norton has years of experience in the online security and cybercrime prevention business and it still ranks among the top in virus and malware protection. Bitdefender is a renowned cybersecurity and antivirus company headquartered in Bucharest, Romania and head by its founder Florin Talpeş who also serves as the company’s active Chief Executive Officer. Florin Talpeş is a visionary entrepreneur with over 20 years of experience in the online security business. He founded the company in 2001 as an end-to-end security provider and in a few years, he not only brought Bitdefender to the forefront of online security but also made it the largest software developer in Romania and one of the most popular antivirus companies in the world. Bitdefender now provides security solutions to SMEs and consumers to businesses and governments spanning across more than 150 countries. What is Norton and Bitdefender in General ? Norton is a multi-device support and multi-OS protection antivirus software from Symantec Corporation – a California-based software company that provides complete security solutions to consumers and businesses alike. Norton is one of the most trusted names in the online security business that is known for its exceptional virus and malware protection capabilities. Bitdefender is a renowned cybersecurity and antivirus company headquartered in Bucharest, Romania that provides security solutions to SMEs and consumers to businesses and governments spanning across more than 150 countries from all kinds of security threats. – Norton offers a host of antivirus software suites and security solutions which are relatively cheaper than most of the other antivirus programs around, starting from as low as $39.99 per year for the Norton Security Standard. It can go all the way up to $109.99 per year for the Norton Security Premium package for 10 licenses. Bitdefender Family Pack is comparatively a better cost-effective alternative to Norton, offering unlimited licenses for the whole year for only $119.99. Bitdefender Total Security costs $89.99 per year for up to 5 devices and Internet Security costs $79.99 a year for 3 devices. – Norton is a lightweight antivirus program which has a very less effect on you system performance in terms of resource use because it performs really well when it comes to memory management. In addition, Norton flushes the unwanted memory periodically to keep the memory usage at a minimal level. Bitdefender, on the other hand, does not give utmost priority to system performance than Norton, thereby compromising system performance in terms of memory management and resource use. Bitdefender is the clear winner when it comes to system performance. – While Norton and Bitdefender both provide total security solutions to individuals and organizations alike, Bitdefender delivers robust security with more security-related features and extra utilities through its host of antivirus suites than Norton. 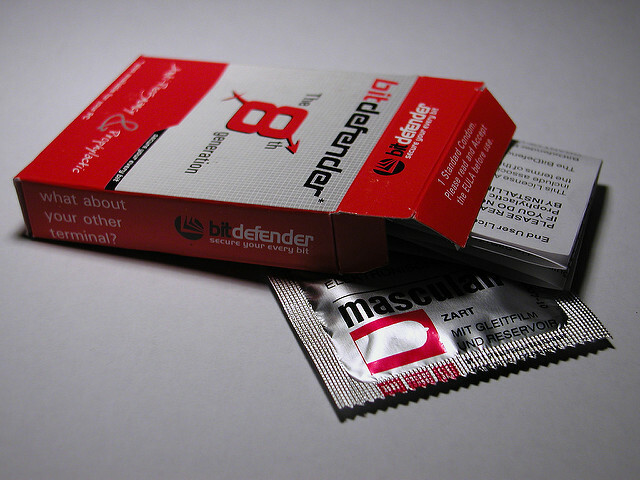 Tests suggest Bitdefender is better in virus and malware protection. While both share several common features, Bitdefender offers quite some of its own that include Rescue Mode, Game and Movie Mode, Anti-fraud Protection, File Shredder, etc. Norton and Bitdefender are the two most recognized names in the antivirus business that provide complete security solutions to consumers, SMEs, large enterprises, and even government organizations, through their host of antivirus suites. Norton offers a host of antivirus software suites and security solutions which are relatively cheaper than most of the other antivirus programs around, whereas Bitdefender delivers robust security with a global security infrastructure that is focused on providing all-around security solutions for everyone in need. Norton is better memory-efficient than Bitdefender though, when it comes to resource use and system performance. Sagar Khillar. "Difference Between Norton and Bitdefender." DifferenceBetween.net. 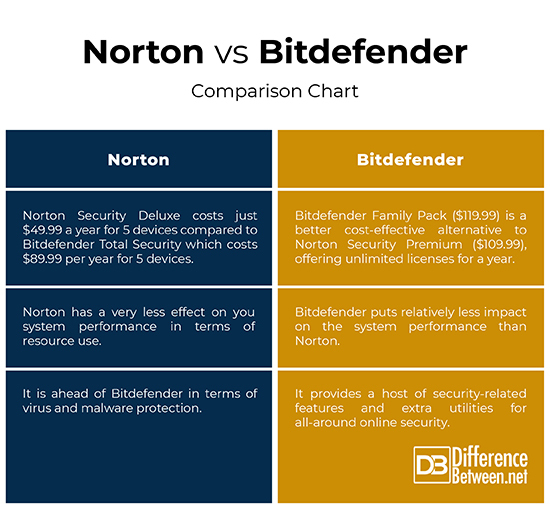 April 4, 2019 < http://www.differencebetween.net/technology/difference-between-norton-and-bitdefender/ >.